Canon is a popular Japanese MNC that is known for its range of cameras, camcorders and other imaging and optical related products. If you're gifting a camera to your teenage child or a professional model for a budding photographer inside you, Canon surely has a product to best suit your requirements. Since buying a camera or a camcorder is heavy on pockets, it is advisable to research all the available options and then select the best model. To help you in this context, we have shortlisted the most popular types of Canon cameras along with their best-selling models. Part 1. Which Cannon Camera Range Suits You? Part 2. Which Canon Video Camera Suits You Best? Part 3. How to Add and Convert Canon Camera Videos? Expert compact cameras: Portable in size and a perfect alternative to DSLR with high-quality image capturing. Bridge Cameras: Comes with high optical zooms with full creative control and grip like DSLR. Superzoom Cameras: Features compact body with powerful zoom lenses. Point and Shoot Cameras: Easy to handle, these pocket size cameras are best to carry no matter wherever you may go. 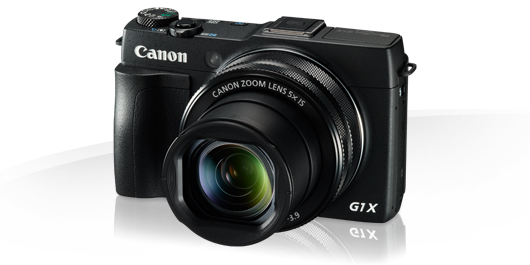 One of the best Canon cameras in this range is PowerShot G1 X Mark II. This model by the company is capable of capturing 12.8 MP images with DSLR like Full HD videos. The camera comes with large 1.5-type 18.7 X 14.0 mm Canon CMOS sensor that also features multi-aspect shooting. It has intelligent IS image stabilization guard to prevent camera shake. Additional features knitted into the camera include 31-point AiAF, manual focusing with manual focus peaking, option for WiFi and Image sync, integrated 14bit RAW and DPP software, customizable dual control rings and others. DSLR for beginners: Entry level models, best for new users who are new to photography and DSLR. DSLR for Enthusiasts: Models with advance features and best suited for users who wish to take their photography to a next level. DSLR for Professionals: High-end models with all advance features and best suited for professional photographers. 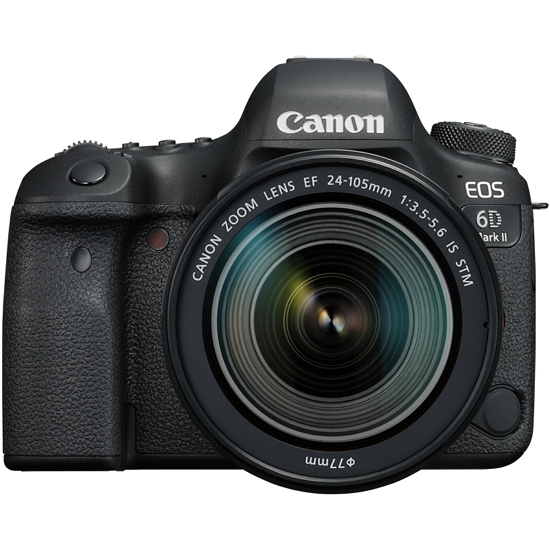 EOS 6D MARK II is one of the popular Canon DSLR cameras that comes knitted with all features to take your photography to the professional level. The model features 26.2 full frame sensor that offers shallow depth-of-field with detailed and dynamic images. Its advanced AF feature with 45 AF points allows focusing on the subject even in low-light conditions. The Vari-Angle screen of this Canon DSLR camera can be rotated in any direction to facilitate taking images from any angle. It also features built-in GPS to tag your images. Additional specifications of the model include an intelligent viewfinder, ISO 40,000 that can be expanded up to 102,400 and Bluetooth, NFC and WiFi support. Considering the features, EOS 6D MARK II can be considered as one of the best Canon professional cameras. Mirrorless Camera is a digital camera that features interchangeable lens and makes use of image sensor for providing an image to rear display or EVF. Mirrorless Camera got its name due to the fact that they do not have a mirror in their optical path. These are also known as Mirrorless Interchangeable-lens camera (MILC), Compact System Camera (CSC) or a hybrid camera. When compared to DSLR’s, these cameras are compact, lighter, and easy to use. These cameras are perfect for the users who wish to move from point-and-shoot devices but do not want to go for DSLR. The light in the Mirrorless Camera passes through the lens and then on the image sensor that in turns take image preview which is displayed on the rear screen. 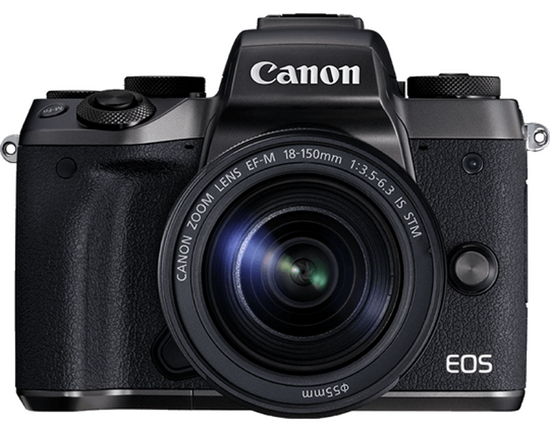 Canon has some impressive models to its mirrorless range that comes packed with great features. Canon EOS M5 is the flagship model by the company and apt for users who are looking for DSLR like speed without compromising on quality. This portable power packed model features 24.2MP CMOS sensor with DIGIC 7 for capturing impressive quality images at super fast speed. The Dual Pixel CMOS AF of the model along with 5-axis digital stabilization allows shooting full HD 60p movies with precision. With WiFi, NFC and Image Sync connectivity options, you can connect your camera to smart devices, take backup and shoot remotely as well. Additional specifications of the model include shooting with 7fps with Servo AF, powerful DIGIC processing, high-resolution tilting screen and central electronic viewfinder. So no matter whether you are looking for a high-end professional model, a new canon camera or a cheap canon camera, the company has models of all types to suit your requirements. Consumer HD Camcorder is best suited for the general users who want to record good quality videos of their precious moments. These camcorders are user-friendly and have features that can be easily managed by a beginner as well. These cameras are best to record your wildlife trip, wedding footage or your child’s first stage performance. LEGRIA is one of the ranges of HD camcorders by the company that is good for consumer use. LEGRIA HF R86 is a compact Canon HD camcorder that allows capturing stunning videos effortlessly. The model features ¼.85 type full HD CMOS sensor with 3.28 total pixels and 2.07 MP. The 57x advanced zoom coupled with 32x optical zoom and 1140x digital zoom allows recording details of the distant objects. The Image Stabilizer makes sure that videos are steady. To make your video recording experience fun and comfortable, the model features simple touchscreen control with ergonomic design. Additional specifications include slow and fast motion recording, baby mode, built-in WiFi, framing assist seek, full HD 1080p recording, and others. For the professional users who cannot compromise on anything less than the best, Canon professional HD camcorder is the apt choice. 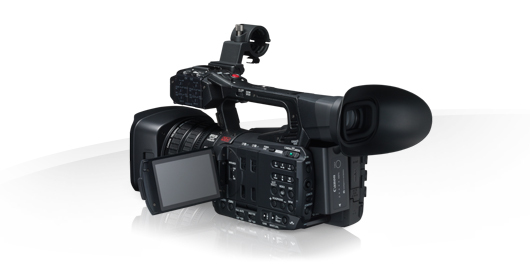 These camcorders come loaded with all the features that a professional need to record superb performances. The professional devices allow recording detailed and precise videos in all types of conditions and feature extensive manual controls. 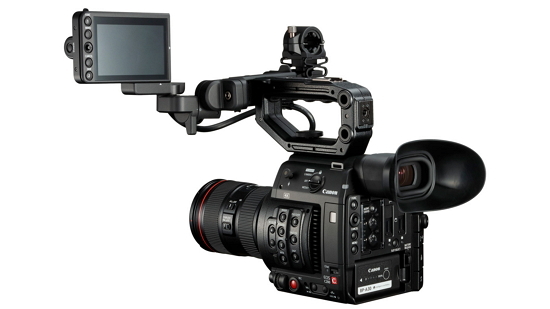 XF205 is one of the most popular professional Canon HD video cameras by the company that offers high-end performance. It is a lightweight model that can be easily carried no matter wherever you may go. The HD CMPS Pro sensor of the model makes sure that you record amazing quality videos even in low-light conditions. For long-distance shots, it features 20x, f/1.8 wide angle zoom lens. It had OLED display and 1.23m dot viewfinder for accurate monitoring. Recorded videos can be easily shared using WiFi or Ethernet features. Other specifications of XF205 include dual format recording, Timecode, Genlock, multi-cam integration, infrared shooting mode, wide DR gamma, 4 channel recording and others. To keep up with the growing demands of the users, Canon keeps introducing new models of the camcorder. 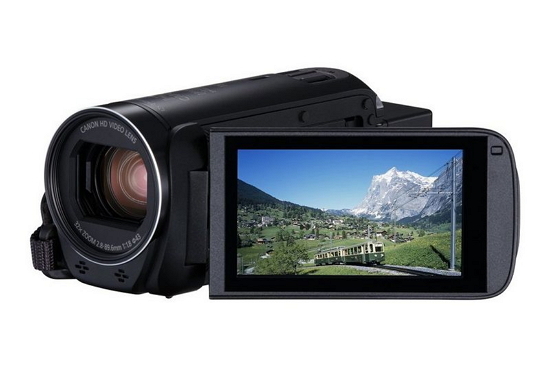 The latest HD camcorders from the company have advanced features and functions needed for excellent video recording. One of the latest additions to the list is Canon EOS C200 which is a member of the popular Cinema EOS line of cameras by the company. The most striking feature of this model is its capability to shoot RAW and is thus the perfect choice for users who want RAW format as their main codec. The camcorder features built-in electronic viewfinder with 4 inch LCD touchscreen and ergonomic grip that makes recording easy and convenient. “Cinema RAW Light” which is the new format for recording is also supported by this model. Additional features include smooth and reliable AF, browser remote control, dual DIGIC DV6, super 35, type CMOS sensor, and others. Different models of Canon cameras allow recording video in an array of formats, but still, there are chances that your desired format is not supported by the Canon cameras or camcorders. Additionally, you may at times also need to transfer or share recorded videos with your family and friends and thus need a format with smaller size. In all, the above and many other situations, the best solution is to convert Canon Camera videos to other desired format. Wondershare UniConverter (originally Wondershare Video Converter Ultimate) is one excellent program that allows converting all your videos to an array of formats. The software allows directly adding videos from camcorder to the program and then converting it to the desired format with just a few steps. More than 1,000 formats are supported by UniConverter (originally Wondershare Video Converter Ultimate). The conversion speed of UniConverter (originally Wondershare Video Converter Ultimate) is 30 times faster and it also supports device-specific format conversion. In addition to video conversion, the program supports a host of other functions as well like downloading, editing, and burning videos. 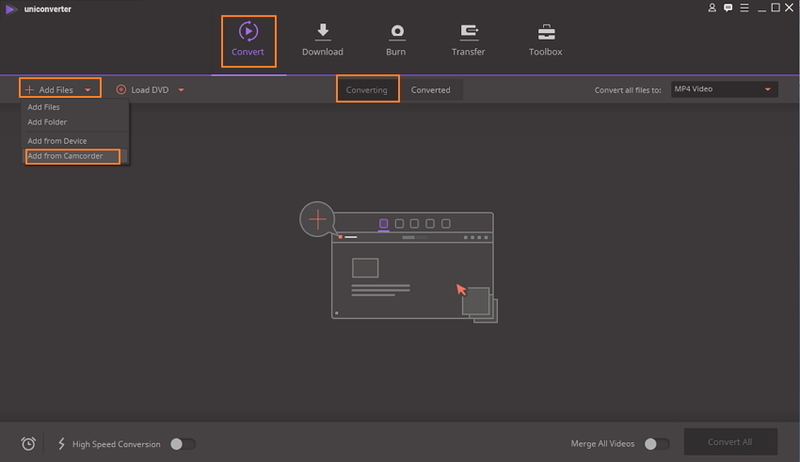 Wondershare UniConverter (originally Wondershare Video Converter Ultimate) is available for Windows and Mac users and has handy and quick features. Download, and install the Canon Camera Video Converter on PC/Mac. Download, install and open Wondershare UniConverter (originally Wondershare Video Converter Ultimate) on your computer, in terms of your computer system, you can choose the Windows version or the Mac version, here we make the Windows system for example. Connect Camcorder to PC and add camera videos directly. Using a USB cable, connect your camcorder to the PC. On the software interface, under Convert section and then select the Converting tab. Next, click drop-down menu beside Add Files and select Add from Camcorder. A pop-up window will open showing all videos present on your Canon Camcorder. Select the desired videos that you want to convert and click Add to Convert List. On the top-right corner, click drop down arrow beside Convert all files to. Next, select the desired output format from Video Tab. Other preset related to resolution and quality of the video can also be selected. Finally, click Convert All button to start the conversion process. The Success message will appear beside the video after successful completion of the process. Keep your creativity alive and relive your special moments forever by capturing them in form of images and videos using best DSLR Canon or Canon HD video camera. And if you want to show your videos anywhere without any format limitation, just try the video converter soon. Convert camcorder video to over 1000 formats, like AVI, MKV, MOV, MP4, etc. Convert camcorder video to optimized preset for almost all of the devices. Burn camcorder video to playable DVD with attractive free DVD template.